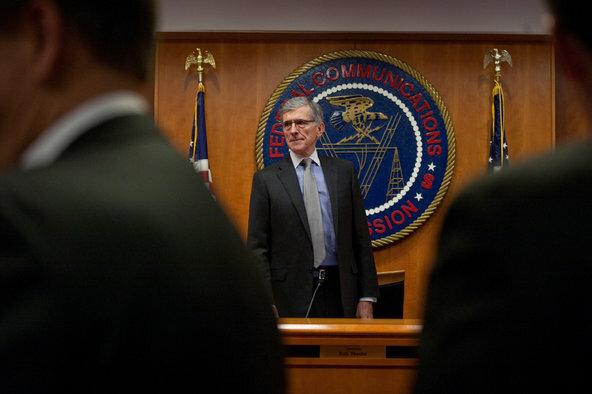 Daniel Rosenbaum for The New York Times Tom Wheeler, the chairman of the Federal Communications Commission, which might appeal a ruling that limits how it regulates broadband providers. For a subject that sounds mind-numbingly dull, “network neutrality” is the most important issue facing the Internet since, well, the Internet. The idea behind net neutrality is that the web material we see on our laptops and smartphones, whether from Google or a tiny little blog, should flow freely through the pipes of the Internet, regardless of origin, destination or content. No one gets special treatment. But what if someone is willing to pay for her data to go faster? This is capitalism. Can’t the people who own the pipes charge more? The issue has come to the fore now that a federal appeals court has ruled that the Federal Communications Commission can no longer stand in the way of AT&T, Verizon and other Internet service providers that might want to create Internet express lanes. The premise behind net neutrality goes back to the days of the telegraph. Even then, everything moved at pretty much the same speed. Since the 1970s, the F.C.C. has prevented telecommunications companies from playing favorites on long-distance telephone lines. And it’s not as if your electric company charges you one rate for the electricity to power your refrigerator and another for the electricity to use a washing machine — or offer special, high-price options to those who want power during shutdowns. The question is, Has the Internet become so fundamental to our lives that it is, in essence, a utility that should be subject to regulation? For the likes of AT&T, Comcast and Verizon, the answer is no. They contend that if a Google or a Netflix wants to pay more to travel in the fast lane, let it. Customers, they say, will be better off. The F.C.C. and others worry that such an arrangement would let Internet service providers play favorites and give preferential treatment to those who can pay for it. How could a nascent start-up compete with a Google or a Netflix if its content wasn’t delivered as quickly or at the same quality? And what is to stop someone from outright blocking content? Frankly, many people simply do not trust the AT&Ts and Verizons of the world. “There’s a long history of the telcos saying, ‘We’ll be good people, we’ll act like the rules are in place,’ and then six to nine months later they are breaking those rules,” said Christopher Libertelli, a former senior legal adviser to the F.C.C. and now the head of global government relations at Netflix. In 2007, for example, Comcast slowed traffic involving the BitTorrent file-sharing format, and the F.C.C. had to step in. Then, in 2010, Verizon blocked people from using Skype on its network, citing congestion. And in 2012, AT&T blocked people with unlimited data plans from using Apple’s FaceTime video chat features unless they subscribed to a more expensive plan. Mr. Libertelli said Netflix was already seeing instances of its service slowing in certain areas and the company could not do much about it. In these cases and many more, the cable and telecommunication companies are blocking products that directly compete with the services they offer. The Internet providers say customers should be allowed to decide with their wallets, switching to a competing provider if they do not agree with another’s business practices. But most Americans do not have options to switch. A 2013 F.C.C. report about competition among wired Internet service providers found that almost one-third of Americans have only one possible provider in their home with high-speed Internet that travels at six megabits a second or more. Another 37 percent of Americans have only two choices. Susan Crawford, a visiting professor at Harvard Law School, notes in her book “Captive Audience: The Telecom Industry and Monopoly Power in the New Gilded Age” that telecoms are already making astounding profits while continuing to invest in new infrastructure. Profit at Verizon Communications has risen by double-digit percentages in recent years, pulling in more than $2.2 billion in profit during the third quarter of last year. AT&T, the second-largest American carrier after Verizon Wireless, reported profit of $3.8 billion during the same quarter. Tim Wu, who coined the term “net neutrality,” said he worried that the telecommunications companies were too big and too powerful to lose this battle. “The F.C.C. is afraid of the companies they regulate. They are capable of being intimidated by them,” said Mr. Wu, a professor at Columbia Law School. But Mr. Wu, who has written extensively about similar regulatory issues, predicts that this could backfire on the Internet service providers, leading to stricter regulation or to companies like Google calling their bluff. For now, though, the wagons are circling the wagons. That is, until a line in one direction or another is breached — at which point, the future of the Internet may be changed forever.